$44.00 "Alexander Nevsky", 1942. Political Publishing House, from "Our Great Ancestors" series. $60.00 "Semyon Konstantinovich Timoshenko", A Short Biography, Military Publishing House, Moscow, 1940, 15pp, hand-tipped halftone portrait frontispiece, Russian text, hard cover. Library discard: shows stamp of the Red Army Archives dated 1946 plus library stamps. $30.00 "Our Great Ancestors", A. Vysotsky, G. Pavlov. Printed in Novosibirsk in 1942. $49.00 "Generalissimo Suvorov" by Leontiy Rakovsky	printed on July 31, 1941 - less than a month after the beginning of the German invasion. $55.00 "Front -Illustrierte" Soviet propaganda leaflet for German troops, March 1942. Uncommon survivor of the propaganda war. $55.00 "Front-Illustrierte" Soviet propaganda leaflet for German troops, very early example from December, 1941. $33.00 "Three Warriors", 1942. The booklet is about three Red Army soldiers: Gerasimenko, Krasilov and Cheremnev who deliberately sacrificed their lives in action against German pillboxes. $54.00 "Old Score to Settle, 1242 - 1942" V.V. Danilevsky. 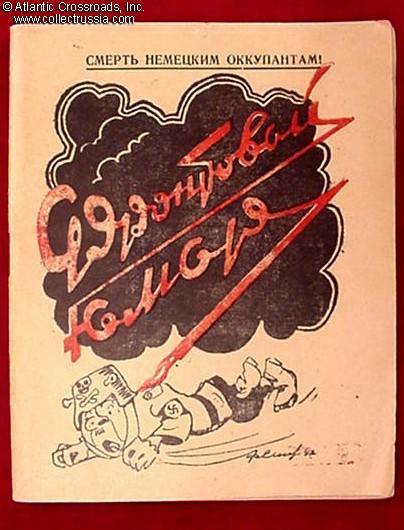 Political Publishing House, printed in Sverdlovsk in 1942. $49.00 "Song About a Politzai", small poster for distribution in the occupied areas of the Ukraine	The cartoon and venomous verses in Ukrainian language target the members of the local police force for collaboration with the Germans. $20.00 "What Hitler Has in Stock for the Slavic Nations", late Summer - early Fall 1941. $25.00 Proclamation to the troops of the South Front, early 1942. $27.00 "Proclamation to the Civilian Population of Donbass", Spring 1942. Subtitled "Death to German Invaders! " $32.00 Letters from Occupied Territories, circa 1943. $34.00 Illustrated propaganda flyer for Ukrainians on occupied territories. Circa 1943.